How Does HazCommpliance, LLC Assist Employers with the Right to Know? You can send us an up to date inventory list that you develop yourself. We are then able to provide you those lists of the products in YOUR inventory. How do we manage your online MSDS inventory? Now that we know what your products are and have built your (M)SDS inventory, HazCommpliance places them in your very own online folder. From here, you may log on through our website and enter your assigned user name and password. To update your inventory, simply call or email us to add the product to your specific location and within 24 hours, the product is live online. The username is your; you may have as many people as you want with access. Additionally, we are constantly updating our inventory with the revised GHS SAFETY DATE SHEETS. Every quarter you will receive email updates from us informing you of the percent of updated SDS versus the MSDS within your inventory. How Do We Differ from Other MSDS Online Companies? Other service companies may simply provide you a platform to store your documents on, or there may be a certain amount of updating occurring. Others merely give you access to millions of documents, hoping that the one you need is in there. At HazCommpliance, we personalize your inventory and hazards. The value added with us is the personal review of your hazards and the tailored inventory you receive. The hazards lists are provided so that hazard communication training may be specific to your facility, to your hazards. In other words, we actually help you maintain compliance with the entire Hazard Communication Standard, from (M)SDS to hazard identification to materials for training, rather than merely providing you with general documents. An MSDS, or material safety data sheet, is a document that identifies a product and its physical and health hazards. Information such as the hazardous ingredients, physical and chemical characteristics, primary routes of entry, exposure limits, carcinogenicity, precautions for safe handling and emergency and first aid procedures are also included on an MSDS. This document is intended to convey hazards of the chemicals that employees work with on a daily basis. Why do I need an MSDS inventory? Employees come in to contact with hundreds of thousands of different chemicals. The Occupational Safety and Health Administration (OSHA) have estimated that there are over 32 million workers exposed to hazardous chemicals in over 3.5 million workplaces (48 FR 53282). Some jobs require constant, daily exposure to particular products, such as the cleaning industry with cleaning products. Other jobs may be filled with a little more variety. Whatever industry one is employed in, there is a chance that there are chemicals of one sort or another that the employee is being exposed to. Such chemicals can come in the form of the aforementioned cleaning products, or straight chemicals in manufacturing, or even the nail polish remover used in salons. These chemicals, or products, may be harmful to one's health, either acutely or chronically. Employee safety, whether be it a tangible physical hazard such as a broken rung on a ladder, or an unseen lethal hazard, such as Freon gas, are both concerns that the OSH Act of 1970 encompasses. The overall general safety is the goal of the standards created by the Secretary of Labor. Thus, it is with this safety in mind that the Hazard Communication Standard, 29 CFR 1900.1200, was promulgated – to inform employees of the hazards associated with the products that they are exposed to on a daily, or less than daily, basis. Armed with the information of such hazards, one may be properly protected against the unseen threats posed by certain chemicals. The Hazard Communication Standard (HCS) was initiated in 1974, though it did not become fully effective and enforced until January 24, 1989. Like other OSHA standards, it is one that has evolved through much debate and decisions and is still changing with new data, new chemicals, and new ways to improve the health and safety of employees in the workplace. An MSDS inventory is central to the requirements of the HCS. The sheets are the main way that hazards are communicated to the people who work with chemical products. All products must have an associated MSDS from the manufacturer or distributor. A complete physical inventory of the products in your facility performed by HazCommpliance, and the corresponding MSDS search will bring your MSDS inventory up to date and in compliance with the HCS. What if I don't have an MSDS inventory, a written communication program, or an employee training program? Failure to comply with the HCS can result in citations from OSHA. During an inspection from an OSHA compliance officer, an officer "requests a copy of the employer's Hazard Communication Program. Under OSHA's Hazard Communication Standard, employers must establish a written, comprehensive communication program that includes provisions for container labeling, material safety data sheets, and an employee training program. The program must contain a list of the hazardous chemicals in each work area and the means the employer will use to inform employees of the hazards associated with these chemicals." (OSHA Inspections - osha.gov/Publications/osha2098.pdf). What types of industries are cited? All industries with chemicals can get inspected and cited if they are not in compliance. The minimum number of employees a business needs to make them subject to this standard is ONE. Unlike other standards that may have a minimum number of twelve or twenty employees to fall under compliance, the Hazard Communication Standard requires only one employee for an employer to be required to maintain compliance. One of the most frequently cited CONN-OSHA standards in public schools is 29 CFR 1910.1200, Hazard Communication (2006 CONN-OSHA Quarterly, #47). The top three cited industries in Connecticut for violations of the Hazard Communication Standard from October 2005 to September 2006 were heavy construction contractors, educational services, and the automotive repair, service and parking industry. Last year, from October 2006 through September 2007, the most frequently cited were highway and street construction companies (SIC 1611). All industries that work with products from greases to cleaners to paints are responsible for maintaining compliance under the HCS. Don't let your industry top next year's list for the most frequently cited for the standard. For more details on most cited industries for the HCS, visit the Industry Profile for OSHA Standard 19101200 page. What are the steps in converting your MSDS inventory to an electronic inventory? Step 1: Conduct a product inventory at your facility. - You may conduct a physical inventory and send us a list of the products you have. Step 2: WE procure the MSDS for your products. They are departmentalized and alphabetized and then uploaded on to your account and ready to access. Is my business, school system, or town on the violations list? What are the fines for a violation? Serious: A serious violation exists when the workplace hazard could cause injury or illness that would most likely result in death or serious physical harm, unless the employer did not know or could not have known of the violation. OSHA may propose a penalty of up to $7,000 for each violation. Other-Than-Serious: An other-than-serious violation is defined as a situation in which the most serious injury or illness that would be likely to result from a hazardous condition cannot reasonably be predicted to cause death or serious physical harm to exposed employees but does have a direct and immediate relationship to their safety and health. OSHA may impose a penalty of up to $7,000 for each violation. De Minimis: De minimis violations are violations that have no direct or immediate relationship to safety or health and do not result in citations. Other: A violation that has a direct relationship to job safety and health, but is not serious in nature, is classified as "other." Failure to Abate: A failure to abate violation exists when the employer has not corrected a violation for which OSHA has issued a citation and the abatement date has passed or is covered under a settlement agreement. A failure to abate also exists when the employer has not complied with interim measures involved in a long-term abatement within the time given. OSHA may impose a penalty of up to $7,000 per day for each violation. Repeated: An employer may be cited for a repeated violation if that employer has been cited previously for a substantially similar condition and the citation has become a final order of the Occupational Safety and Health Review Commission. A citation is currently viewed as a repeated violation if it occurs within 3 years either from the date that the earlier citation becomes a final order or from the final abatement date, whichever is later. Repeated violations can bring a civil penalty of up to $70,000 for each violation. Our clients are quite capable of maintaining compliance on their own. Like most things, however, bringing an inventory up to date takes time. A lot of time. For those who have a current inventory and MSDS book and feel confident that their inventory is full of products that need to be there - keep up the good work. For those who have inventories that need to be reassessed for an accurate updating and/or clean out, this service is a practical, economic solution. Instead of using the manpower of a useful employee to be thorough with an inventory and search, spending possibly hundreds of hours, outsourcing the task to HazCommpliance is a more viable option. An SDS, or safety data sheet, is the newer version of the (M)SDS as revised by OSHA in order to align the standard with the GHS (see below for GHS). These new documents must have a set order of their 11 (OSHA enforced) to 16 sections. 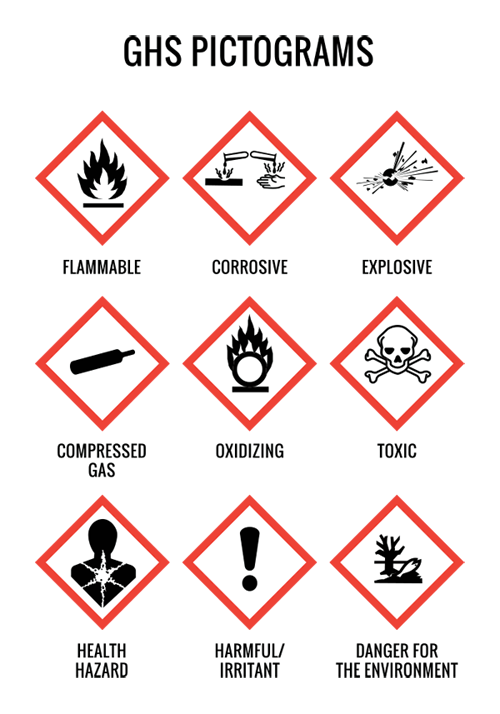 Additionally, hazards are reclassified and assigned applicable hazard categories, any related pictograms, and signal words (Danger or Warning). Hazard statements and precautionary statements are also standardized and listed. The Global Harmonized System (GHS) of Classification and Labeling of Chemicals is a system for harmonizing the hazard classification and other hazard communication elements. This effort is worldwide to better unify the way different countries classify hazards and provide the downstream information. If I am an End User, do I need to convert my (M)SDS to SDS? By when? Manufacturers are responsible for revising the (M)SDS to the new SDS. If you are an end user of a chemical, you may request the updated version from the manufacturer. These documents should all be revised by June of 2015. End Users then have until June of 2016 to obtain the newer SDS documents. I am a Manufacturer of Chemicals- How do I revise my (M)SDS to SDS? Revising an (M)SDS to SDS is not as simple as re-ordering the sections to comply with the new format. Chemical ingredients need to be reclassified according to the guidelines in the GHS, and the appropriate hazard statements, precautionary statements, signal words, and labeling elements must be included. Many manufacturers will seek outside assistance from companies such as HazCommpliance to assist in this revision. What do The New Pictograms stand for? Why do I need an (M)SDS Inventory? Employees come in to contact with hundreds of thousands of different chemicals. The Occupational Safety and Health Administration (OSHA) have estimated that there are over 32 million workers exposed to hazardous chemicals in over 3.5 million workplaces (48 FR 53282). Some jobs require constant, daily exposure to particular products, such as the cleaning industry with cleaning products. Other jobs may be filled with a little more variety. Whatever industry one is employed in, there is a chance that there are chemicals of one sort or another that the employee is being exposed to. Such chemicals can come in the form of the aforementioned cleaning products, or straight chemicals in manufacturing, or even the nail polish remover used in salons. These chemicals, or products, may be harmful to ones health, either acutely or chronically. An (M)SDS inventory is central to the requirements of the HCS. The sheets are the main way that hazards are communicated to the people who work with chemical products. All products must have an associated (M)SDS from the manufacturer or distributor. A complete physical inventory of the products in your facility performed by HazCommpliance, and the corresponding (M)SDS search will bring your (M)SDS inventory up to date and in compliance with the HCS. What if I don’t have an (M)SDS inventory, a written communication program, or an employee training program? Failure to comply with the HCS can result in citations from OSHA. During an inspection from an OSHA compliance officer, an officer “requests a copy of the employer’s Hazard Communication Program. Under OSHA’s Hazard Communication Standard, employers must establish a written, comprehensive communication program that includes provisions for container labeling, material safety data sheets, and an employee training program. The program must contain a list of the hazardous chemicals in each work area and the means the employer will use to inform employees of the hazards associated with these chemicals.” (OSHA Inspections ). All industries that work with products from greases to cleaners to paints are responsible for maintaining compliance under the HCS. Don’t let your industry top next year’s list for the most frequently cited for the standard. Is your business, school system or town on the violations list? What are the types of violations and how much can they cost? Willful: A willful violation is defined as a violation in which the employer knew that a hazardous condition existed but made no reasonable effort to eliminate it and in which the hazardous condition violated a standard, regulation, or the OSH Act. Penalties range from $5,000 to $70,000 per willful violation. Why would I need to hire a Service to do this? Our clients are quite capable of maintaining compliance on their own. Like most things, however, bringing an inventory up to date takes time. A lot of time. For those who have a current inventory and (M)SDS book and feel confident that their inventory is full of products that need to be there—keep up the good work! For those who have inventories that need to be reassessed for an accurate updating and/or clean out, this service is a practical, economic solution. Instead of using the manpower of a useful employee to be thorough with an inventory and search, spending possibly hundreds of hours, outsourcing the task to HazCommpliance is a more viable option. How do I become Compliant with the HCS? Call HazCommpliance for a consultation 860-432-0351 and ask for Jennifer, or email her at .